Deletionism and inclusionism are opposing philosophies that largely developed within the community of editors of the online encyclopedia Wikipedia. The terms reflect differing opinions on the appropriate scope of the encyclopedia and corresponding tendencies either to delete or to include a given encyclopedia article. Inclusionism and deletionism represent the poles of a spectrum of views, with adherents tending toward either a more relaxed or a more restrictive understanding of Wikipedia's concept of notability. Many users do not identify strongly with either position. "Deletionists" are proponents of selective coverage and removal of articles seen as unnecessary or highly substandard. Deletionist viewpoints are commonly motivated by a desire that Wikipedia be focused on and cover significant topics – along with the desire to place a firm cap upon proliferation of promotional use (seen as abuse of the website), trivia, and articles which are, in their opinion, of no general interest, lack suitable source material for high quality coverage, or are too short or otherwise unacceptably poor in quality. To the extent that an official stance existed as of 2010, it was that "There is no practical limit to the number of topics it can cover" but "there is an important distinction between what can be done, and what should be done", the latter being the subject of the policy "What Wikipedia is not". The policy concludes "Consequently, this policy is not a free pass for inclusion". The "Association of Inclusionist Wikipedians" and the "Association of Deletionist Wikipedians" were founded by administrators. [dubious – discuss] Each has a Wikimedia page listing their respective members, charters and principles. While written in humorous tones, they reveal the perceived importance of Wikipedia held by the members. According to veteran contributor Geoff Burling, newer members are less likely to have helped delete articles that should have been kept on hindsight, and so exercise less caution. Journalism professor K.G. Schneider has identified the mentality of deletionism as having manifested once the emphasis of the encyclopedia shifted from quantity to quality. Documentarian Jason Scott has noted the large amount of wasted effort that goes into deletion debates. Deletion debates may contribute to community disintegration, restriction of information, or a decrease in the rate of article creation that suggests a decrease in passion and motivation amongst editors. Being explicitly called an inclusionist or deletionist can sidetrack the issue from the actual debate. Nevertheless, some have observed that the interaction between the two groups may actually result in an enhancement of overall quality of content. 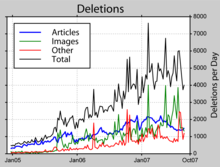 In 2009, Wikipedia began to see a reduction in the number of edits to the site, which some called a result of user frustration due to excessive deletionism. Comic book and science fiction/fantasy novel writer Peter David became involved in a November 2009 discussion on the deletion of actor Kristian Ayre's Wikipedia biography. David took issue with the quality of the discussion and what he perceived as deletionism on the part of some of the project's editors. He wrote about the experience in his "But I Digress ..." column in Comics Buyer's Guide #1663 (March 2010), remarking that "Wikipedia, which has raised the trivial to the level of art form, actually has cut-off lines for what's deemed important enough to warrant inclusion." In attacking the practice in general, David focused on the process by which the merits of Ayre's biography were discussed prior to its deletion, and what he described as inaccurate arguments that led to that result. Referring to the processes by which articles were judged suitable for inclusion as "nonsensical, inaccurate and flawed", David provided information about Ayre with the expressed purpose that it would lead to the article's recreation. The article was recreated on January 20, 2010. Wikipedia co-founder Larry Sanger identified himself as an inclusionist, except on certain topics pertaining to sexuality, for his Citizendium project. Wikimedia Foundation executive director Katherine Maher also identifies as inclusionist. Andrew Lih, a deletionist-turned-inclusionist, observes a cultural shift from Wikipedia's initial expansion in that it has become more cautious. He changed his position when an article he created about the social networking website Pownce was speedily deleted by another administrator as advertising. ^ David E. Gumpert (2007-09-05). "A Case Study in Online Promotion". BusinessWeek. Archived from the original on 2008-03-12. Retrieved 2008-01-23. ^ a b c d e Besiki Stvilia; Michael B. Twidale; Linda C. Smith; Les Gasser (2007). "Information Quality Work Organization in Wikipedia" (PDF). Journal of the American Society for Information Science and Technology. 59 (6): 983–1001. CiteSeerX 10.1.1.163.5109. doi:10.1002/asi.20813. Archived from the original (PDF) on 2007-08-20. Retrieved 2008-01-24. ^ a b c d e f Douglas, Ian (2007-10-11). "Wikipedia: an online encyclopedia torn apart". The Telegraph. London: Telegraph Media Group. Retrieved 2012-07-10. ^ "Marked for Deletion". Weekend America. National Public Radio. 2007-01-20. Archived from the original on 2014-03-10. Retrieved 2008-01-23. ^ a b c d Karim R. Lakhani; Andrew P. McAfee (2007). "Debates and Controversies in Wikipedia". Harvard Business School. Retrieved 2008-01-23. ^ The Letterman (2006-07-19). "Let Cher Price join Everywhere Girl in the dustbin of history". The Inquirer. Archived from the original on 2008-03-10. Retrieved 2008-01-23. ^ a b c d "L'édition de référence libre et collaborative : le cas de Wikipedia" (PDF). Les Dossiers de la Veille (in French): 25. April 2006. Retrieved 2008-01-24. ^ "Democratisation of Knowledge with Katherine Maher". YouTube. Retrieved 9 May 2017. ^ Adamson Rust (2006-07-14). "Everywhere Girl: You're deleted". The Inquirer. Archived from the original on January 12, 2008. Retrieved 2008-01-23. ^ "Wiki high executioner executes Everywhere Girl". The Inquirer. 2007-01-30. Archived from the original on 2013-02-22. Retrieved 2008-01-23.